Solar Eclipse August 11, 2018. Leo, 18 degrees. There is a download of energy containing truth and knowledge about how quantum theory affects us personally. This knowledge is a part of our awakening. The eclipse chart for August 11--New Moon and Sun at 18 degrees of Leo-- suggests unstable energy. We need to center. Whatever happens, take time to visit the still place inside. From that inner still place we can find the guidance to be adaptable to our surroundings and to the people in our lives. Be an example for others who are spinning out of control. If you are spinning out of control, sit down and breathe. If you can help those who are suffering, of course you will do that. There is a download of energy containing truth and knowledge about how quantum theory affects us personally. This knowledge is a part of our awakening. The download looks like it is in a container of multi-colored fluidity shaped like a sacred rectangle. Sacred knowledge is raining into us. It will affect our DNA and nervous system. The downpour from other dimensions has been going on for a long time. This is just another installment. Energy showers have increased in intensity since the full solar eclipse last August, 2017, and acceleration has continued with each eclipse event. One activity leads to another activity so quickly. Every day there is new information to absorb and integrate. We have one foot in this tangible realm and one foot somewhere else! What is the truth? Perhaps it depends on what frequency you are standing in. We have one foot in this tangible realm and one foot somewhere else. We are getting more accustomed to “somewhere else” and we are learning how to be in both locations at the same time. This is a new experience in wholeness. When you do a shamanic journey, you are in two places simultaneously, on an energy level. When you sleep you are in two places at the same time. When we make love we sometimes experience another dimension sitting right inside the physical body space. Psychoactive plants open portals to other places. Music, prayer, meditation, dance, ritual, contemplation and creative expression are all doorways to other spaces and places. Now we are really learning that we are always living in two or more places simultaneously. Awareness is getting bigger. Once we become comfortable with living in many energy places/spaces simultaneously, our attachment to life is different. How we behave will transform. Pretend you are on your life stage. What kind of performance are you giving? This is your solo theater hour. This eclipse is in the sign of Leo. Leo is the king. We are all kings and queens. Pretend you are on a stage. This is your life stage, your life performance. What kind of performance are you giving? Does it feel authentic? If yes, big smile! If no, just stand on that stage and ask what you need to do next to bring yourself into alignment with your life performance. No one else can do that for you. This is your solo theater hour. It is you stage time. What do you want to give to your audience? During a solar eclipse, the Moon passes between the Sun and the Earth. The Moon obscures the Sun. In astrology language we say that the Sun rules an individual’s ego. So, a solar eclipse snatches away our usual ego focus and ego tendencies. For a brief time we may feel blocked from our usual course of action, thought, personality tendencies and belief systems. If we are lucky, we are presented with options outside our familiar boxes. We are all being asked to adapt and grow. Some people are forced out of comfortable boxes due to traumatic events. The fires in California push people into a new life chapter. Floods, fires, hurricanes, and tornados—any extreme act of nature requires we let go and leap into the unknown. If we survive, we are forced to adapt and grow. We are all being asked to adapt and grow, but some of us are lucky because we aren’t dealing with a life-threatening situation. Perhaps the growth is internal, or softer, like moving to a new location or changing career. The New Moon Solar Eclipse on Saturday, August 11, in the sign of Leo, is the third eclipse in the past month. It is visible only at very high latitudes, like Siberia and far northeast Canada. Usually there are two eclipses together (solar and lunar). This time we have three eclipses. During this eclipse period, planet Mars has been retrograde in Aquarius with the South Node sitting close to it. The South Node has a lot to do with the past, with karma, and with how things affect us on a body level. All three eclipses have brought up either past issues, karmic difficulties (like the fires) and body issues (perhaps some folks are feeling physical/emotional pain from the collective and Mother Earth herself (!) in their bodies). Everyone is impacted by the eclipse. Wherever you have the signs Leo and Aquarius in your chart, you are affected. The Leo/Aquarius polarity deals with the interplay between the self (the Leo part) and the community (the Aquarius part). It also shows us what is happening between Leo leadership and Aquarian humanity. Aquarius rules the people and the brotherhood/sisterhood of mankind. Leo rules the king, or the leader and leaders. People born under the signs of Leo and Aquarius are greatly affected by the eclipse. Scorpios and Taurus people also are impacted in a big way. We need an individual reading of the horoscope to address how the eclipses might affect any particular individual. I want to make one important clarification about the word karma. When I mention the karmic impact on people going through the trauma of fires, I do not mean all those people have bad karma from living in California. I just mean the catastrophic earth event has thrown them into a serious, karmic situation that has to do with our earth and our society. Some type of earthly karma is causing those people great suffering. There is no blame here. The World is changed by our example, not by our opinions. One of the things we are learning during these three recent eclipses is how the world is changed by our example, not by our opinions. The outpouring of bizarre opinions that we are assaulted with everyday should be teaching us that all the different frequencies of beliefs and opinions is just chatter. When we begin to change internally and know we are multidimensional beings, that we belong to the Universe and to each other, then life on earth will change as well. Regarding the upcoming Full Moon Lunar Eclipse on July 27th: "We are living in the shadow and it is important for us to be the change, be the love, and become the shamans. It is time to grow our own souls for we cannot solve these problems at the vibration that they were created." Marilyn Zimmerman....Aquarian enlightener, artist, teacher, feminine guide, visionary, and friend! This full moon lunar eclipse on July 27 will not be visible in our hemisphere. Africa, the Middle East and Asia will witness the visual phenomenon of the longest eclipse in this century. Apparently some Christian groups have assigned "end of times" meaning to this Blood Moon eclipse as well as the other blood moons we have been experienced in the recent past. Perhaps instead of the end of the world, the full blood moons of the recent past--and this upcoming eclipse--are an invitation to collective awakening for visionary changes and kindness to one another.The Moon is associated with the unconscious and with all that we experience in our bodies. Let's set an intention for awakening our unconscious blockages and freeing our bodies from the entrapment of worn out beliefs that freeze potential for ourselves and for humanity. The eclipse occurs at 4 degrees in the sign of Aquarius. Aquarius is the Water Bearer....the one who brings watery, emotional enlightenment to humanity. Saturn rules Aquarius and Aquarius is a fixed sign. The energy of this sign can stay stuck in the rigidity of conventional Saturn; if can stay buried in the fear of losing one's own status or position in society; it can attach to hoarding, greed and self-survival. OR it can break free and build new containers and new foundations (both physical and non physical) for evolution on planet Earth. Saturn in Aquarius has the capacity to view reality through a spiritual lens. Truly Aquarius has the potential for the true meaning of Saturn: we are responsible and we do the job because it needs to be done. We don't do it for self interest or to climb a totem pole. We do it because we it is right thing to do for oneself and for all sentiment beings. Personal reflection: What is my responsibility to myself and to my family and friends, and to life on this planet? How can I be a part of the enlightenment for a better world? Let's start with kindness, compassion, truth and the offering of intelligent solutions for problems that support what Roman Emperor, Marcus Aurelius, said so many centuries ago (161-180 AD): "Everything is connected and the web is holy." To believe otherwise only contributes to the end of all that has been achieved in human consciousness since the beginning of time. Blood moons have inspired both awe and fear throughout the centuries. The Full Moon in May is traditionally referred to as Wesak, the celebration of the birth of the Buddha. Scorpio is assigned the job of transformation of birth, death and re-birth. If we tune in to this Full Moon we can experience our own little birth, death and re-birth. The Full Moon occurs at 9 degrees of Scorpio, the Sun opposing at 9 degrees of Taurus. The Scorpio-Taurus polarity is highlighted. Taurus, ruled by Venus, is about the Earth plane. What are my resources? How can I acquire more resources? Having something gives me value. There is truth in the Taurus experience. Grown-ups should provide food, clothing and shelter for themselves if at all possible. Pluto rules the opposite sign, Scorpio. Pluto pushes us to let go. One way to express the meaning of Pluto is this: Not my will, but THY will be done. The word, Thy, can mean Life, the Universe, the Divine, God, Goddess, Nature, Fate, or any other expression that works for you. Taurus tells us what to keep. Scorpio tells us what to share and what to let go of in order to find meaning in life. Somewhere in that mix we accept we are powerless (that’s the Pluto part) over some aspects of our life. This Full Moon is rich and complex. Challenges are balanced with cosmic help! Saturn, the taskmaster – the planet we associate with frustration, delays and hardship – makes a flowing, easy connection with the Sun in Taurus. We can get things done, or we can envision how we will get things done in the near future. Mars and Pluto are holding hands during this time. Normally we would think Mars and Pluto are ready for a fight. Mars is the battlefield and Pluto intensifies that field. In this case Mars and Pluto are connected to other planets that offer opportunity to take appropriate assertive action, not impulsive war. Mars and Pluto together in Capricorn suggests restraint to this strong aggressive aspect. Planet Jupiter, moving through Scorpio, is making a wide conjunction with the Moon. Jupiter amplifies the deep seriousness of Full Moon in Scorpio. Both the Moon and Jupiter make a beautiful connection with Neptune. 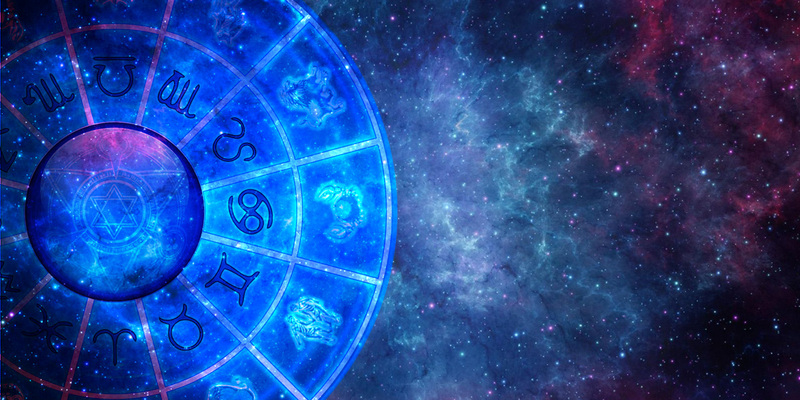 Spiritual inspiration, good will and loving connection with others, and the acceptance of life’s mystery are all indicated by the Moon-Jupiter-Neptune connection. On the Collective/Global Scene, this easing of obstacles is seen in the new peace agreements between South and North Korea. Now a big exhale as we look at the stress in this complex mix of planetary energies. The Nodes of the Moon are squaring the Sun and Full Moon. The North and South Node give information about our fate and destiny. Those who are especially affected by this Full Moon (born in 1943, 1921, 1981, 1999, 2018) might be drawn into exploring their life history and meaning, coming face to face with their fate. This Full Moon will help some individuals contemplate whether or not they are on the right path. Questions of an authentic life and a meaningful existence are suggested by this Full Moon. Some of our existence may seem fated by family or cultural events. Prior to our birth, there is an eclipse. That is the eclipse that really affects our fate and destiny. Imagine you are inside a big square, a big box, or a square room. This is the Moon/Sun/North Node/South Node GRAND Square of this full moon. Here are some suggestions for things to do inside this room. Breathe, write some morning pages, light a candle, chant a mantra, meditate, drum, toss the IChing, pull an oracle card, draw out a time line of your human journey. Embrace your life essay—feelings, thoughts and physical manifestations of the essay (family, work, partners and friends). How does it feel? Can you find some peace in this room? Can you get a sense of what to release from your life and what to keep? Can you relax and accept destiny and fate and still feel life calling you for more . . . calling you more deeply into your mystery? Connecting with the Full Moon in Scorpio gives us a chance to be reborn again and to welcome new awareness of our journey.